Q: According to reports, on November 24, Special Representative of China on the China-India Boundary Question and State Councilor and Foreign Minister Wang Yi and Special Representative of India and Indian National Security Adviser Shri Ajit Doval held the 21st Meeting of the Special Representatives of China and India on the Boundary Question in Chengdu, Sichuan. Could you give us more details on this meeting and its main outcomes? A: The 21st Meeting of the Special Representatives of China and India on the Boundary Question was held in Chengdu, Sichuan on November 24. This is the first meeting of its kind since President Xi Jinping and Prime Minister Narendra Modi met in Wuhan and since State Councilor and Foreign Minister Wang Yi took up the post of the Special Representative. State Councilor Wang Yi had a very good talk with Indian National Security Adviser Doval, during which the two sides had an in-depth exchange of views on the boundary issue, bilateral relations and international and regional issues of mutual interest. China and India have issued the readouts respectively, which I believe you may have seen. In particular, I would like to draw your attention to the fact that the two sides put forward a host of forward-looking and workable proposals and suggestions on advancing boundary talks, upholding peace and stability and promoting cooperation in the border areas during the meeting. It is fair to say that the two sides in general shared similar views and thinking in many areas. The two sides agreed to entrust the Working Mechanism of Consultation and Coordination on China-India Border Affairs to start the consultation for early harvest, review the relevant suggestions made by the two sides, work in a creative way and conduct systematic study regarding the areas and items on which initial agreements were reached during the Special Representatives' Meeting, seek out measures and proposals at an early date, form concrete outcomes, and create and build enabling conditions for the final settlement of the boundary question. Q: It is reported that on November 25, at a special summit in Brussels, Belgium, the European Union endorsed the draft deal on the UK's departure from the bloc. What is your comment? A: The Chinese side has been closely following the UK's withdrawal from the EU. We have noted that on Sunday, the EU held a special summit, during which the agreement on the UK's withdrawal from the EU and the political declaration on the future relationship between the EU and the UK were approved. Both the EU and the UK are China's comprehensive strategic partners. When the EU and Britain remain prosperous, stable and open Europe and Britain, all parties stand to benefit. China hopes that the UK and the EU can reach a final agreement on Brexit. China's policy on developing the China-EU and China-UK relations in parallel will remain unchanged. We stand ready to work with the EU and the UK to make new contributions to the peace, stability and prosperity of the world. Q: According to the Russian Federal Security Service, three Ukrainian naval ships reached the Russian border on Sunday morning in the Black Sea. Russian forces used weapons to force the three Ukrainian ships to stop and then they were seized. Do you have any comment on this? A: We have noted relevant reports. 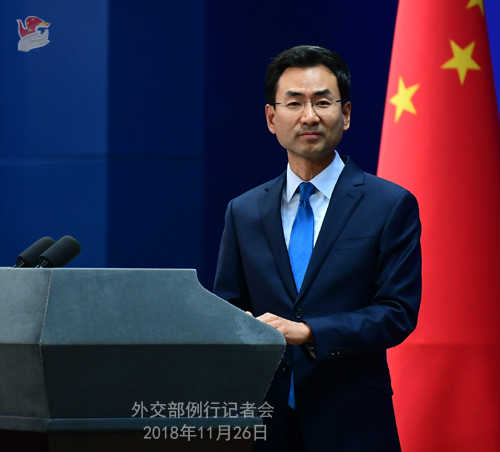 The Chinese side calls upon all relevant parties to exercise restraint, avoid the escalation of the situation and properly resolve differences through dialogue and consultations. Q: A British named Peter Humphrey has asked the UK Office of Communications (Ofcom) to revoke the CCTV's broadcasting license for helping stage allegedly forced confession and jailing in China. What is your comment on this? A: China is a country ruled by law. The Chinese judicial departments handle cases and safeguard the legal rights of foreigners in China in accordance with the law. The British citizen Peter Humphrey you mentioned already pleaded guilty and showed repentance when he served the sentence, and he was released on June 9, 2015. As to the CCTV's operation in the UK you asked about, to give you a principled response, we believe that news agencies serve as a bridge and bond that promote mutual understanding and friendly exchanges between people of different countries and we hope the UK side will support and facilitate the normal reporting work by foreign media in the UK. Q: Recently, tensions rose in Kosovo after police arrested some Serbs in the Serb-dominated northern town of Mitrovica on the ground of investigating the killing of a Serb leader earlier this year. Before this, the decision made by Kosovo to levy 100% tariffs on all imports from Serbia and Bosnia and Herzegovina has also aroused discontent from relevant parties. What is your comment? A: The Chinese side has taken note of the relevant situation. We always believe that the best way to resolve the Kosovo issue is seeking a solution mutually acceptable to the parties concerned through dialogue within the framework of the relevant resolutions of the UN Security Council. The relevant parties should avoid saying or doing anything that may complicate and escalate the situation. Instead, they should continue with practical and constructive dialogue to actively seek a lasting solution to the Kosovo issue. Q: There are certain interesting phrases concerning the talks of the Special Representatives on both sides. The Indian press release said that the two sides have decided to "intensify efforts" for a solution. The Chinese press release also talked about "advancing" the process. You used today the word "early harvest" for a particular solution to emerge. Are the two countries expediting efforts to reach a solution to this border dispute? 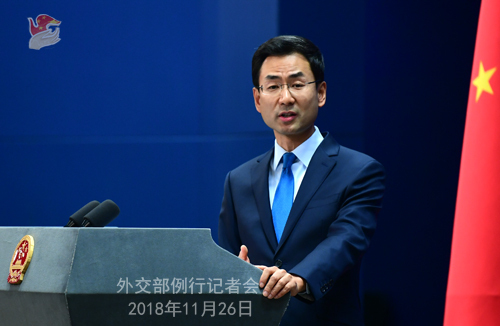 A: On November 24, the 21st Meeting of the Special Representatives of China and India on the Boundary Question was held in Chengdu. Both China and India have released the readouts on that and I also answered a related question just now. 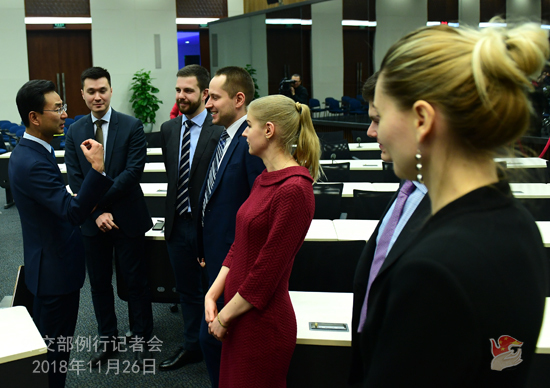 I want to point out that this meeting is the first one since State Councilor Wang Yi took up the post of the Special Representative. The meeting was held in a cordial atmosphere and our two sides had a very good exchange of views and reached many future-oriented and constructive outcomes. As I just said, our two sides will hold further consultations on the early harvest. Here I want to stress that since the meeting of the two leaders in Wuhan this year, the China-India relations have achieved positive progress in an all-round way, thus entering a new stage of development. Under the current international situation, the strategic significance of our bilateral ties becomes more prominent. Our two sides will act on the important consensus reached by the two leaders to strengthen strategic communication, increase political mutual trust and advance cooperation across the board. Meanwhile, we will jointly move forward the settlement process of the boundary question and uphold peace and tranquility of the border areas.